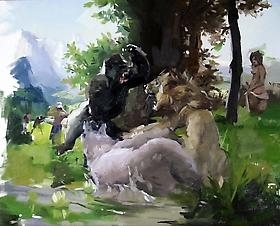 PATRICK MIKHAIL GALLERY is pleased to announce that ANDREW MORROW's work "LION VS. GORILLA VS. POLAR BEAR" has been purchased by the Canada Council Art Bank for it's permanent collection. Mr. Morrow's painting is among a list of new artist works purchased by a range of established and emerging contemporary Canadian as part of the Art Bank's latest purchase program. Ottawa, June 20, 2011 – The Canada Council Art Bank is acquiring 52 new works by Canadian artists, including paintings, photographs, sculptures, and drawings, worth a total value of $303,025. The selection committee chose the works from 1,875 submissions received. The Art Bank purchases include works from all regions of Canada. The new selections of works by senior artists Liz Magor, Jeff Thomas, Joanne Tod, and Serge Tousignant are complimented by works by emerging artists who are already receiving major recognition like David Harper, Meryl McMaster, Aidan Urquhart and Anna Williams. Images of these artists’ work can be downloaded from the Canada Council image gallery. The works were selected on the basis of artistic excellence, significance to current art practice and suitability for rental. Regional representation and cultural diversity were also considered. A full list is attached. The members of the acquisition committee were: Lorraine Gilbert, photographer and professor at the University of Ottawa (Ottawa), Heather Igloliorte, artist and art historian specializing in Inuit art (Ottawa/Labrador), Rick Leong, painter (Victoria/Montreal), Sarah Maloney, sculptor (Halifax). The Canada Council Art Bank, with approximately 17,500 works, has the largest collection of contemporary Canadian art in the world. It was created to support the efforts of Canadian visual artists and to provide government and corporate offices with the opportunity to rent Canadian art for their offices and public spaces. Since 2001, the Canada Council Art Bank has acquired close to 900 works through its purchase program. Currently, one third of the collection is on rental and displayed in office and public spaces, giving Canadians across the country access to a variety of works by Canadian artists.